PARSIPPANY, N.J.--(BUSINESS WIRE)--Sep. 5, 2017-- B&G Foods, Inc. (NYSE: BGS) announced today the latest innovation in the growing line of Green Giant® frozen veggie swap-ins – Green Giant Veggie Spirals™. These spiral-shaped vegetables are a great alternative to pasta and will initially be available in Zucchini, Carrots and Butternut Squash varieties. 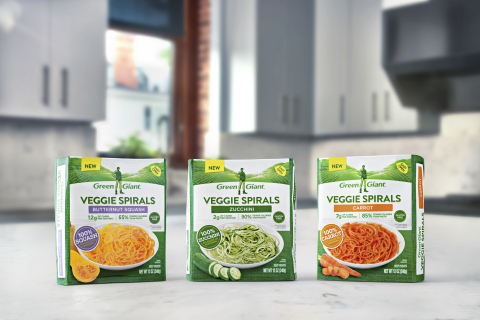 Green Giant Veggie Spirals are 100 percent vegetables, with no sauces or seasonings and provide consumers with an easy way to add more nutritious veggies to any meal. Each variety of Green Giant Veggie Spirals is gluten-free, Paleo-friendly, low calorie and ranges from 65-90 percent fewer carbs than traditional pasta. B&G Foods purchased the Green Giant brand in November 2015, and through new product innovation and enhanced marketing has increased distribution and net sales of Green Giant frozen vegetables. As B&G Foods previously announced, net sales of Green Giant frozen products grew $9.4 million or 14% for the second quarter of 2017 as compared to the second quarter of 2016, driven by the brand’s new frozen innovation products that launched in late 2016. Green Giant also recently announced the expansion of the Green Giant Riced Veggies, Green Giant Veggie Tots and Green Giant Mashed Cauliflower lines, with the introduction of five new products in September 2017. Statements in this press release that are not statements of historical or current fact constitute “forward-looking statements.” The forward-looking statements contained in this press release include, without limitation, statements related to the expected launch of Green Giant Veggie Spirals and the brand’s other new innovation products and the timing thereof, whether Green Giant Veggie Spirals and the brand’s other new innovation products will meet the demands of today’s consumers and whether and when Green Giant Veggie Spirals will achieve nationwide distribution. Such forward-looking statements involve known and unknown risks, uncertainties and other unknown factors that could cause the actual results of B&G Foods to be materially different from the historical results or from any future results expressed or implied by such forward-looking statements. In addition to statements that explicitly describe such risks and uncertainties readers are urged to consider statements labeled with the terms “believes,” “belief,” “expects,” “projects,” “intends,” “anticipates” or “plans” to be uncertain and forward-looking. The forward-looking statements contained herein are also subject generally to other risks and uncertainties that are described from time to time in B&G Foods’ filings with the Securities and Exchange Commission, including under Item 1A, “Risk Factors” in the Company’s Annual Report on Form 10-K for fiscal 2016 filed on March 1, 2017 and in its subsequent reports on Forms 10-Q and 8-K. Investors are cautioned not to place undue reliance on any such forward-looking statements, which speak only as of the date they are made. B&G Foods undertakes no obligation to publicly update or revise any forward-looking statement, whether as a result of new information, future events or otherwise.